Wildlife safaris are just about everywhere in South Africa! The Western Cape / Garden Route is endowed with its fair share of safari experiences, with several safari lodges between Cape Town and the Garden Route offering enticing wilderness accommodation and exciting guided safaris. As a bonus, the road trip through the Western Cape and along the Garden Route is wonderfully scenic, and what’s more, the entire region has no malaria risk. 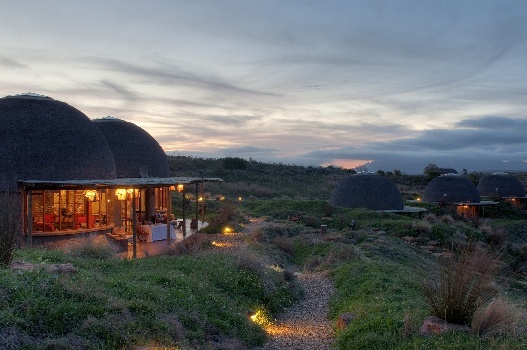 Here we share our choice of lodges for a memorable Cape safari. A phenomenal Cape wilderness and safari experience can be had in 5-star luxury in the Sanbona Wildlife Reserve, about 2.30 very pretty hours away from Cape Town. 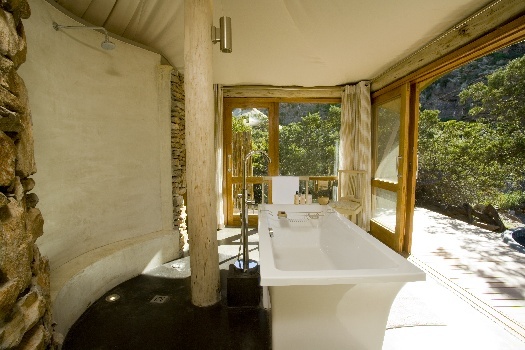 We were lucky to enjoy a most fabulous stay at Dwyka Tented Lodge in the Sanbona Reserve – it’s a gorgeously chic tented safari camp set in a curve of a dry ravine. The tents are luxuriously open-plan and very inviting, and a huge spoil is the jacuzzi out on your private deck. For families, Gondwana Lodge is the place to stay in the Sanbona Reserve because it’s fantastically well geared up for kids to have an unforgettable safari. 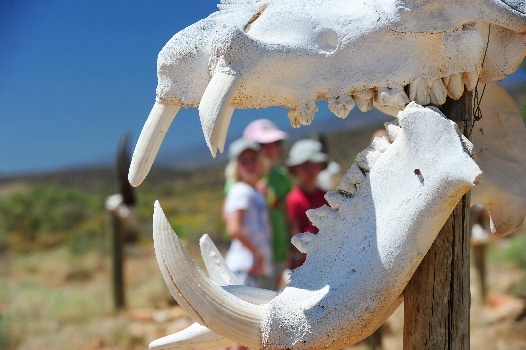 Gondwana Lodge’s skull garden is a place that kids are not likely to forget in a hurry – and it’s very educational too. Exceedingly private and personalized, Sanbona’s Tilney Manor is a good choice for guests wanting a quiet and very gracious safari. The game experience at Sanbona is superb, the setting is perfectly soul-smoothing, and the cuisine excellent. Mail us. The Garden Route Game Lodge is a well-priced option situated 3.5 hours away from Cape Town in the Albertinia area. It’s located on the Cape Town – Garden Route journey, so consider it for a night ot two as an on-route option – which we did recently on a return trip from the Eastern Cape. 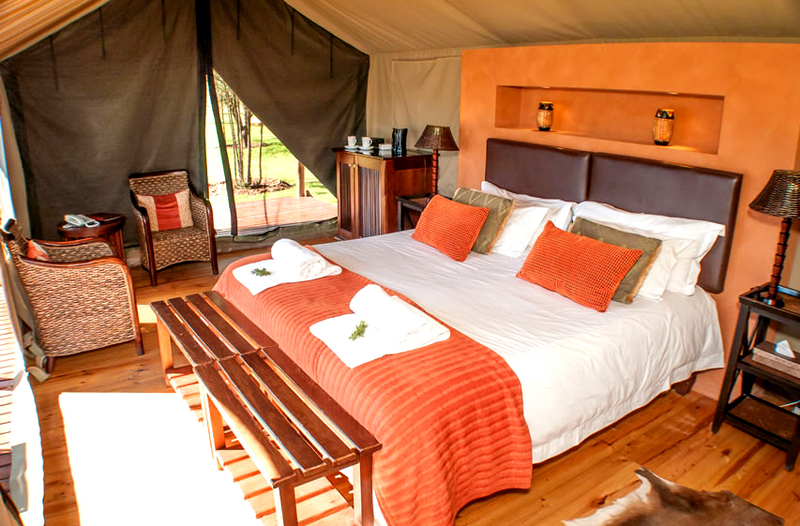 Spacious safari rooms and smaller chalets are available. 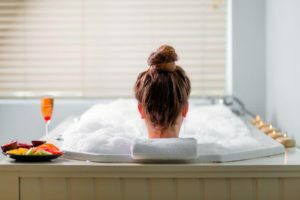 They are comfortable, and well equipped with tea stations, mini-bars, heaters and hairdryers. On your guided safaris you have a good chance of seeing white rhino, giraffe, buffalo , cheetah, antelope and a number of smaller mammals. There are a few elephants at home there too, and these have been rescued from a threatening situation. There are also some lion, kept in an enclosure. Birds are plentiful, and reptile encounters can be enjoyed too – don’t the kids just love them! Mail us. In the Mossel Bay area, a little under 4 hours from Cape Town, we recommend the 5-star Gondwana Game Reserve for a luxurious Big Five safari. It’s a breathtaking world of hillsides and valleys, and offers guests a choice of luxurious accommodation options, some very suitable for families. Free-roaming wildlife includes all of the Big Five, as well as giraffe, various antelope species, zebra and cheetah. Enjoy Gondwana’s guided safaris, intriguing nature walks and spa spoils. For children Gondwana offers an exciting and simultaneously informative Junior Ranger Programme. 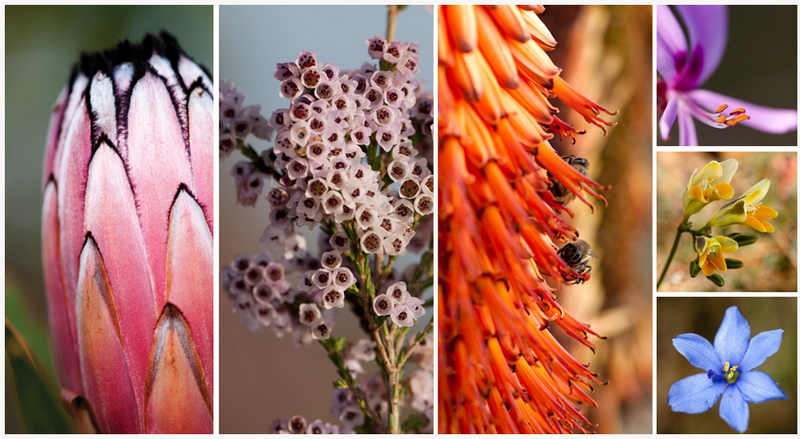 A very special aspect of Gondwana is its fynbos landscape and the many indigenous plants that thrive there. These plants draw many birds to marvel at too. The great thing about Gondwana is that if offers a half-board rate in addition to its full-board rate, making its safari experience accessible to varying budgets. Mail us. 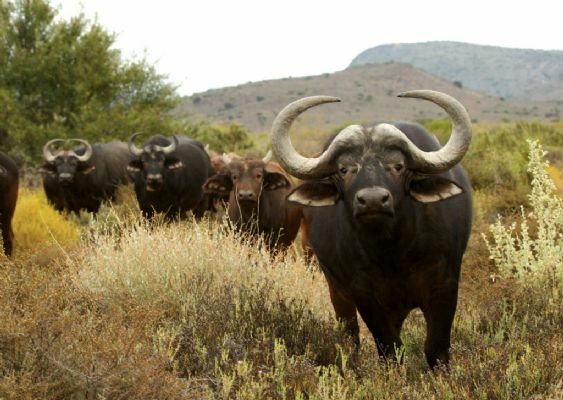 The 4-star Buffelsdrift Game Lodge in the Oudtshoorn area is a rewarding Garden Route / Klein Karoo safari option. Elephants, rhino, Cape buffalo, giraffe, hippo and over 200 bird species make up the array of wildlife in this area. 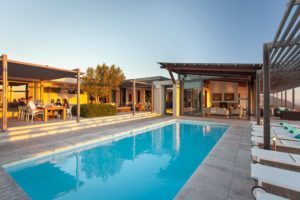 In addition the attractions of Oudtshoorn, the Cango Caves, ostrich ranches and the Swartberg Mountain Nature Reserve are accessible from the lodge. Accommodation is tented and elegant, and some of the tents are positioned at the waterside. 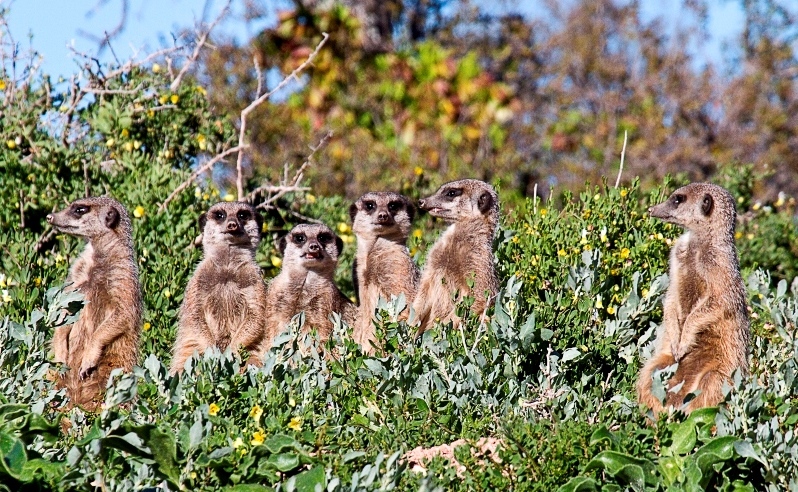 Guided safaris, elephant interaction with orphaned ellies re-homed from the Kruger Park, and meerkat safaris are all part of the Buffesdrift experience. Mail us. Mail us to book your safari, or call +27 21 797-7122.